A working farm owned and stewarded by the Trustees of Reservations, Powisset Farm is a small parcel in the southeast corner of a wealthy rural suburb of Boston. Powisset Farm operates as a co-op type farm. Trails at Powisset Farm connect to the Hale Reservation. The much larger Noanet Woodlands is very close by. NOTE from the Trustees of Reservations: An electric deer fence is maintained around all of our cultivated fields. Please assume that the fence is on at all times. The links below will allow you to view an interactive version of the KMZ trail map on your computer or on your mobile device (iPhone / iPad / Android). By allowing the Google Maps website to 'use your location' on your device, you will be able to see your position displayed on the Google Map. When opening the first link on your iPhone, don't use the Google Maps app - allow the browser to open the link on the Google Maps website. 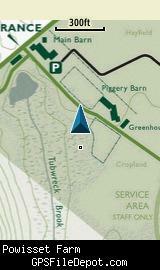 This KMZ map is set to Draw Order 45 so it will show 'beneath' the primary map on your Garmin KMZ-compatible GPS. It will show 'above' my KMZ map of Hale Reservation and also 'above' my KMZ map of the Noanet Woodlands. 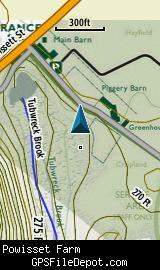 Loading all three KMZ maps will provide you with a seamless trail map of all properties on your GPSr. See the links above to view all three maps together. The image on the left below is from a Garmin GPSMAP 78sc with no other maps displayed. The image on the right is from the same device with the Garmin 24K NE series TOPO maps displayed. I have posted this KMZ as freeware, so instead of paying me for it, send me a note if you found this file helpful! 1) Display it on your Garmin GPS receiver by placing the file in the \Garmin\CustomMaps folder on your supported Garmin GPS receiver. For a list of supported devices, click here. 2) Display it in Google Earth by opening the file (FILE, OPEN). If you would like to be notified when I update this or any of my KMZ maps, subscribe to my notification e-mail service by sending an e-mail to listserv@lists.dbperry.net with the subject line "subscribe gps_maps"
This is a notification list only, and the only posts you will receive are when my KMZ maps are updated. Your e-mail address will not be used for any other purpose (or provided to anyone else except me). If you find the map and this website useful please consider making a donation to offset hosting costs. * You don't need paypal to donate but that is who will process the donation. Initial release using Trustees of Reservations map dated May 2008. NOTE: This is my calculation of the extents of the area(s) with publicly accessible trails on the KMZ map. This should be the area available for hiking or other recreation, but it will also include any portion of water bodies, marshes, swamps, etc. within the boundaries of the properties on the KMZ. It would also include inaccessible conservation land within the boundaries, such as a buffer zone of "Do not enter" land around a reservoir. NOTE: this area includes the ENTIRE KMZ including white space / margins / legend, etc.